I took the four undecorated square and rectangle frames and mounted them in a line on a long acrylic block. Then I stamped them onto a piece of WPlus9 Sweet Gelato cardstock with the coordinating Sweet Gelato ink for a tone on tone look. I stamped each side of the cardstock and then turned the block around and stamped again overlapping the frames to create the background panel. Next I stamped the bottom layer of the largest peony from Fresh Cut Peonies with white pigment ink on kraft cardstock and heat set it so it wouldn’t smear. The top two layers were stamped with Piggy Bank and Sweet Gelato ink. The sentiment is from Thanks a Bunch and was stamped with white pigment ink and then deliberately offset stamped with Sweet Gelato ink to create a little dimension. 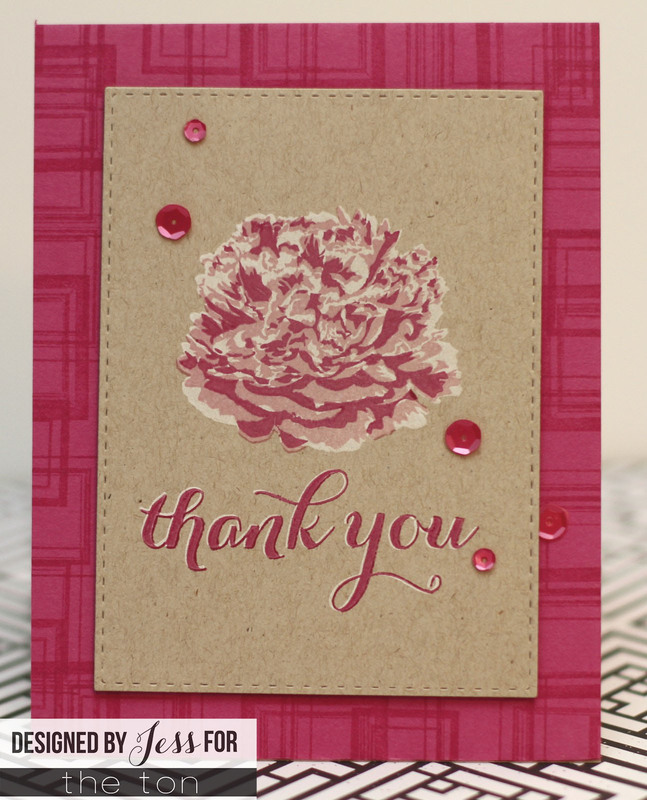 To finish the card I added Strawberry Margarita sequins in 4mm and 6mm sizes. Thanks so much for visiting! If you’ve been wanting to get your hands on some of the fabulous couture sequin mixes from The Ton head over to my blog for a special mini hop and the chance to win 3 couture mixes of your choice!